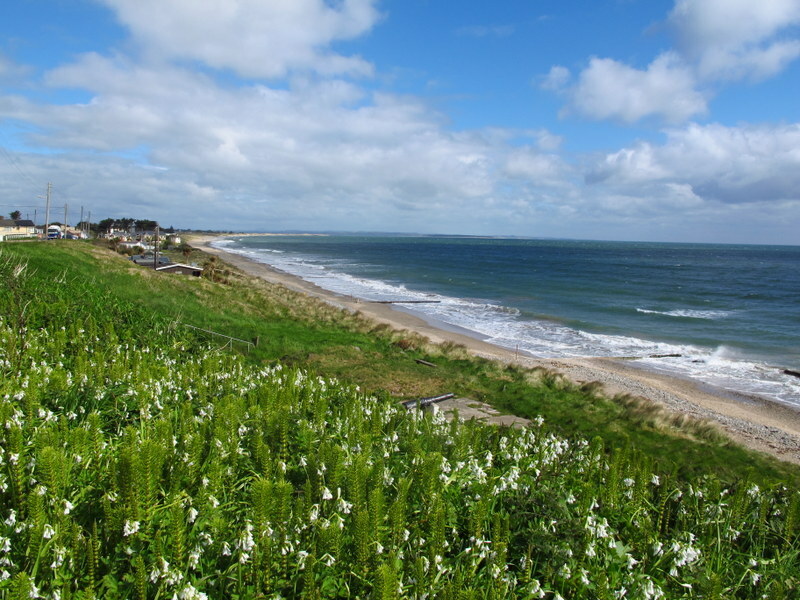 Turns out Rosslare is more than just a ferry port – who knew? I had to wait around for the train this morning so took a drive down to the real town and beach. It’s quite cute and one of the nicest beaches I’ve seen in Ireland; and to think I’ve been here twice and wasn’t even going to look around – one of those hidden treasures people always talk about. Ahhhh, bliss!!! Back on a train with nothing to do but sit back and relax while heading up to Dublin and a five or ten minute walk to my hostel. Staying anywhere but Temple Bar was out of the question, Barnacles Temple House is where I ended up for 2 nights – in a single room though, I’m way to old to enjoy sharing. 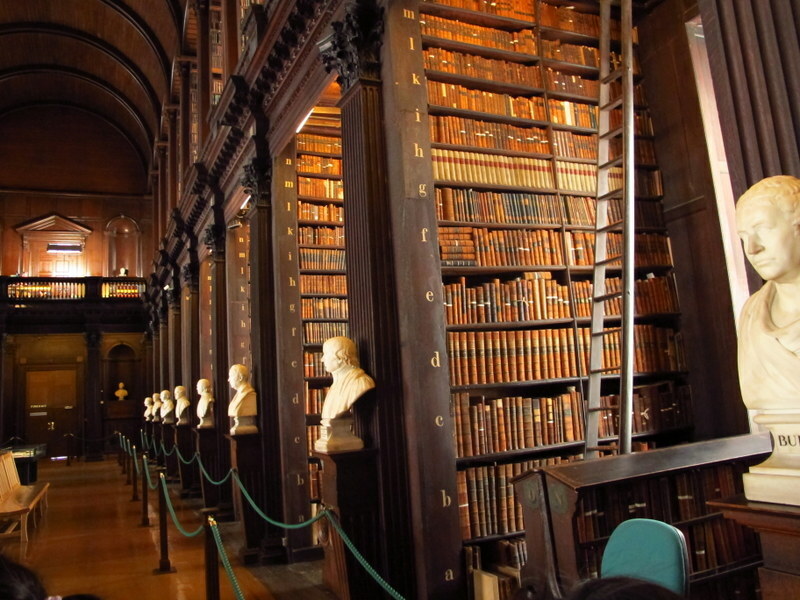 I’m also becoming a pro at ticking one thing off my to do list on the afternoon I arrive, so dumped my gear and headed off to find Trinity College and the Old Library. Got a bargain too, because there was only half an hour left until closing, the entry fee was half price – saved a whole £4.50!!. As I wasn’t that interested in the Book of Kells, I was happy with that. I don’t get tired of seeing the different architecture of these lovely old buildings, and the books – you can smell them, it’s divine! They have cabinets down the middle of the room with a selection of items from the library, the inks display really grabbed my attention but I had plenty of time to have a squiz at all of them. I was so tempted downstairs in the shop to buy something but managed to curb myself!! Found a nice pub in Temple Bar for dinner and listened to the music for a while before heading back to the hostel where I joined the other nerds and caught up on blogging – well, not caught up, but put in some time writing! And the organ grinders had to sleep in the wash house! I really didn’t feel like sightseeing today, but couldn’t bring myself to not see as much as I could in my short stay, so braved the cold and rain to find the nearest hop on hop off bus stop. Everywhere and everyone rates the Guinness Storehouse tour as one of the top attractions here so that’s where I spent the next couple of hours. It was interesting, looks like they’ve essentially gutted the inside of the building but left interesting features and machinery intact. The circular seventh floor is pretty neat with a round bar in the centre of the room with 6 big Guinness taps and glass windows all around for a great view of the city. Your entry fee gives you access to the whole place and a pint of Guinness. It’s not that popular a drink at home and I was absolutely amazed at the number of people lining up for their free pint – my ticket still has the free drink stub attached! It really was a miserable day so I stayed on the bus until we arrived back in the city and then just wandered back to the hostel for an early night – put earplugs in and slept like a log. 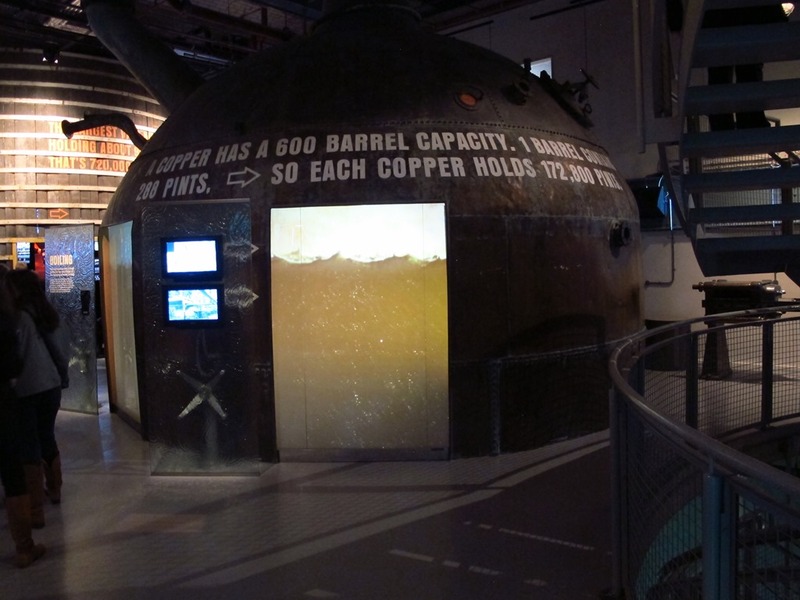 Hope you had a drink (or tow or more) at the Guinness storehouse just to let Merv know you were thinking about him..
Nah, just took heaps of photos to make him jealous!! Thanks Lorna. Ireland certainly is a gorgeous part of the world, and the Irish are such a friendly bunch, it’s a great place to visit.